Have you ever had something that you never knew you needed until you didn't have it? That something that you took for granted and never really put much worth until you found yourself missing it and wondering how you got along without it? In quilting, that would be my design wall. What is a design wall? It's a surface that you can put your quilt blocks on so you can visualize how your quilt will look after you sew the blocks together, This preview allows you to see things in a final perspective and gives you a chance to rearrange the quilt in the most pleasing manner possible. Have you ever put on an outfit that you thought looked great on you but after seeing a picture of yourself in the outfit you cringe? Same concept. You just get a chance to test drive all the possible outcomes of your quilt before settling on the best one for you. When I lived in NH (just a few years ago) my dinning room had the most wonderful bare wall on which I would drape a vinyl tablecloth and stick my blocks on it to 'see' my quilt come to life. 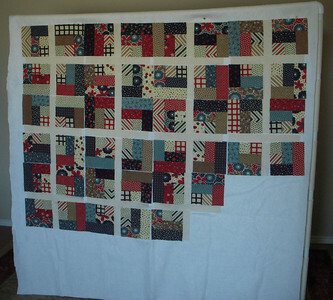 In my current home there are no bare walls and I have been lying my pieces on the floor to get a peak at the quilt as it grows but this method just has not been working for me. 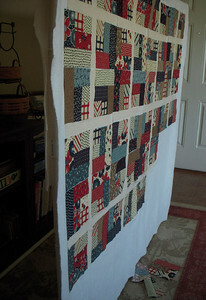 I find that I cannot really step back to look at the quilt or look at it from different angles. I really was having an issue with this. So the problem had to be researched and resolved. At first I thought about getting some cardboard to do a mini design wall but it really didn't resolve the problem. 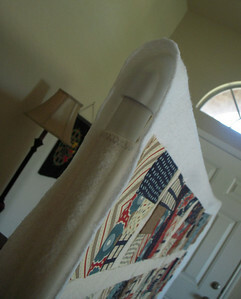 I wanted something that I could put up most of my project and I tend to do lap quilts and not wall hangings. The other option was to buy a portable wall but I couldn't really afford one, so that left me the option to build one. It's amazing what you can do with PVC pipes! I bought 6 PVC pipes (I had the sales person at Home Depot cut one of them in half), a few couplings and headed home to put it all together. I cut down the pieces that had been halved because the back of the wall stuck out too much and I realized I didn't need that extension to give it support. I bought some flannel at Walmart and sewed a sleeve to insert the top and bottom pipes, a bit of Velcro to secure the sides to the PVC and my design wall was open for business. I found that the flannel was a bit too flimsy to hold up my blocks without resorting to pinning them in place (which defeats the purpose of easy rearrangement of the blocks so I draped a piece of batting and that did the trick. Here's my current project on my wall ready to be fiddled with. Do you have a design wall? 2 comments on "The Design Wall"
I would never have thought of the PVC pipe in creating a design wall. I am assuming that you can disassemble it, if necessary. It certainly has solved your problem. 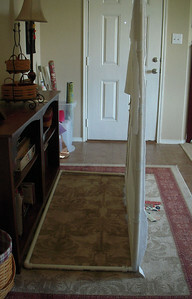 I use a wall in my sewing room and have one of those self stick pieces that can be taken off the wall with no residue left. I can't think of the name of the product right now. I have never taken it down once up. If you would only use a pattern you wouldn't need a design wall, LOL!!!!! I'm so bad; and you're so freakin crafty...it's annoying, LOL! What is up for August..